The small but mighty orchestral package continues to square up to the big guys. When orchestral sample companies began selling their wares 20 years ago, the numbers were stacked against the user: though some high‑end collections cost as much as a used car, it was a struggle to fit more than two or three of their instruments into the limited RAM space of a hardware sampler. Hard disk sample‑streaming put paid to that particular problem, but until Garritan Personal Orchestra came along in 2004, orchestral samples remained a relatively expensive commodity, beyond the reach of all but a privileged few. GPO evened up the odds. It challenged the big‑is‑best ethic of major libraries by cramming the entire orchestra into a 2GB package, and its low, user‑friendly price played a part in forcing other companies to market budget versions of their orchestral collections. (You can read our original review in the October 2004 issue of SOS.) Since its release, Gary Garritan has continued to refine the library, and its fourth and latest incarnation sees some significant changes and improvements. GPO 4.0 remains inexpensive as ever, with discounts available for users upgrading from previous versions. The library's chief strength has always been its comprehensive instrumentation: as well as all the common orchestral instruments it contains non‑standard items such as bass flute, oboe d'amore, Eb and contrabass clarinets, piccolo trumpet and contrabass tuba. A useful clutch of extras (Steinway grand piano, harpsichord, a pipe organ and the rare Glass Armonica) brought the original instrument count up to 60. Though benefiting from the inclusion of true first and second violin sections, the absence of real brass ensembles was a chink in the library's armour. GPO4 rectifies this by incorporating trumpet, trombone and horn sections created by Project SAM, a European company renowned for the quality of their orchestral brass. The new sections add considerable grandeur, and though (like the rest of the library) they have been whittled down to only one dynamic layer, they sit nicely alongside Garritan's brass and blend very well with the other instruments. A selection of SAM solo brass (trumpet, piccolo trumpet, French horn, tenor and bass trombones and tuba) is also included. Maintaining the GPO house style, they incorporate 'ensemble building' patches that allow you to build duos and trios without fear of sample duplication. Another useful extra in GPO4 is a small, beautifully in‑tune choir who perform nice smooth 'oohs' and lusty 'aahs' (but sadly, no 'Cantonas') that can be alternated via keyswitches. I was also pleased by the provision of a 'full strings' patch featuring violins, violas, cellos and basses, mapped according to range and comprising keyswitchable straight notes, tremolo, trills, mutes and pizzicato articulations — a very useful tool for composers and string arrangers. These various additions have increased the size of the original sample pool from 1.83GB to just under 2GB. The most striking innovation in GPO4 is its new custom Aria sound engine, designed by the Plogue software company of Canada. Formerly GPO ran on Native Instruments Kontakt Player and could also be loaded into the full version of Kontakt; now its samples will only play with Aria and can't be edited, or exported to any other player or sampler. Aria offers some distinct advantages over the original player. One is that it has 16, rather than eight, sound slots, each of which can operate on any MIDI channel or in MIDI omni mode. In addition, the new user interface is more roomy and its visual layout clear and intuitive, with fine tuning, output and MIDI channel settings conveniently placed beneath each instrument's name. As well as a whizzy new interface, GPO4's new Aria sound engine introduces significant changes under the bonnet. A mixer screen incorporating faders, solo and mute switches, pan control and a reverb effects send makes it much easier to balance multi‑instrument setups. Each instrument has its own dedicated screen featuring EQ (including parametric mid), auto legato on/off, portamento (i.e pitch slides), decay and automatic variability (designed to increase realism by introducing random changes to pitch and brightness) controls. There's also a user‑settable 'stereo stage' control. The effect of this is pretty subtle, but when you play loud, staccato samples (such as the poky 'aggressive trumpet overlay' patch) you can hear it adding some stereo ambience to the mono samples. Far more telling is Aria's menu of convolution reverbs, which includes a nice big, floaty concert hall and some effective ambiences. As with any orchestral library, to get the best response from GPO4 multi‑instrument setups you'll need a fast computer with plenty of RAM. I found it ran smoothly and solidly on my system, and was pleasantly surprised to note that a full set of 16 instruments took less than 10 seconds to load and consumed only 210MB of RAM. Long‑time GPO users who upgrade to GPO4 will notice that solo instruments which formerly defaulted to monophonic (i.e single‑note) mode now play polyphonically when loaded. The Aria player incorporates a new monophonic 'auto legato' function that detects overlapped notes and automatically modifies their attack and decay settings to help them run together smoothly. Using this mode (which can be turned on and off manually or via a MIDI control command), you can create trills of any interval or direction by holding down a key and rapidly playing staccato reiterations of another note. Alternatively, you can retain polyphony and use the library's original 'sustain pedal legato' facility to smooth out melody lines. The only down side of this is that, with the exception of the Steinway piano, the sustain pedal can no longer be used to sustain notes. Gary Garritan has always supported composers who rely on notation programs to play back their scores, and the latest version of his orchestra maintains the tradition by supplying a complete set of alternative 'notation' instruments for use with Finale and Sibelius. 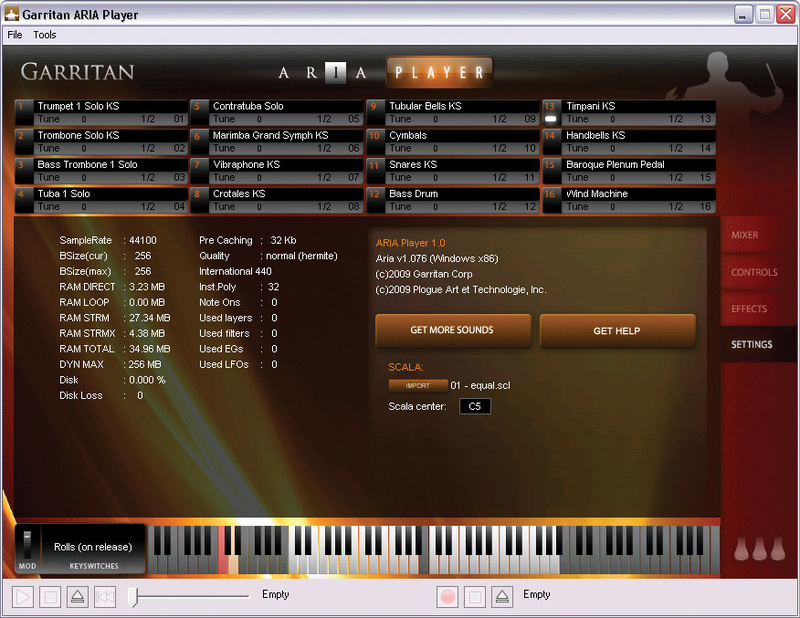 Aria can also play back MIDI files, and even make audio recordings of its own output. The small but vocal group of users who need custom tunings for their orchestral instruments will be pleased to see that GPO4 can import Scala tuning files, 16 of which are provided with the library. These tunings can't be customised, so users who need ethnic variants like Indonesian pelog or Arabic scales will have to search for them at the Scala web site. Each instrument may be tuned by up to a semitone (100 cents) in either direction. There's no control over pitch-bend range (which is set to the industry‑standard two semitones) and, strangely, no global tuning control is provided for the Aria player. Instead, it offers a menu of a dozen or so alternative tuning standards, including such variations as the European A=442. Fortunately, the player defaults to the internationally accepted A=440. GPO was always easy to work with, and the new Aria engine makes it even easier. 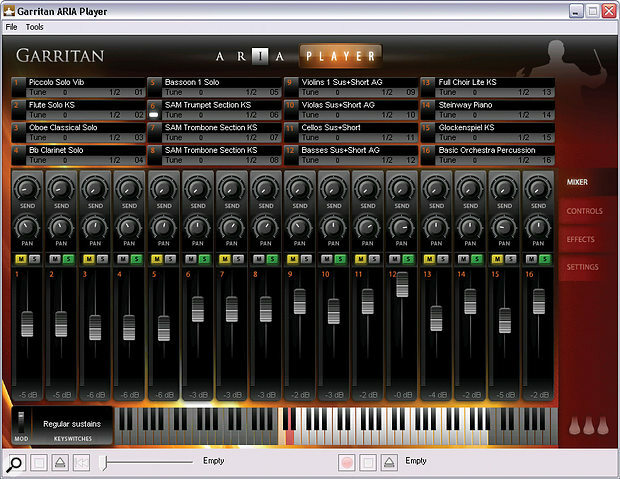 Some may take issue with its lack of editing facilities, but since that's the norm with virtual instruments nowadays, most users are used to working around this restriction. I found the GPO4/Aria combination a convenient way of setting up orchestral scores, and I'd have no hesitation in using it for mock‑ups. No other library allows such a quick and effortless setup of a full orchestra, and few possess as many instrumental options. In Garritan World, small is beautiful, and GPO4's two‑figureprice tag seems a small price to pay for a library with such large musical capability. Other self‑contained 'orchestras in a box' that won't break the bank include Miroslav Philharmonik, based on Miroslav Vitous' groundbreaking orchestral samples (available in a budget 1.5GB 'Classik' version), MOTU Symphonic Instrument (8GB) and the 11GB Silver version of East West/Quantum Leap Symphonic Orchestra Play Edition. For a few dollars more, you can sample the musical detail of Vienna Symphonic Library's Special Edition bundle (Standard version, approximately 40GB). Like Garritan Personal Orchestra, each of these libraries ships with its own custom player, but none matches GPO's full instrumentation. GPO4 is available as a download and on DVD. The makers recommend a 2.8GHz Pentium 4 PC or a 1.8GHz Core 2 Duo Intel Mac machine with 2GB of RAM and 3.5GB of free hard drive space, but caution that they can't guarantee optimal performance on pre‑Intel Mac G5s (though users say the library works with these older machines). The 32‑bit Aria player runs on Mac OS 10.3 or higher and on Windows 7, Vista or XP, and there's also a 64‑bit Windows version. The player works stand‑alone and as a VST, Audio Units and RTAS plug‑in. The library requires no dongle or key: on line activation is done by the novel method of a credit‑card-like 'Activation Keycard' image that contains an encoded version of your registration details. Once you've received this magic picture in an email, you activate the library simply by dragging and dropping it onto the Aria player. CPU‑friendly, instruments load very quickly. The lack of multiple dynamics reduces overall timbral subtlety, but at this price, who's complaining? In these cash‑strapped times, an instrument that can create decent‑sounding orchestral arrangements for less than £100$150 is a godsend. GPO4 doesn't have the range of articulations, multiple dynamic layers, built‑in concert-hall sound or global stereo sampling of larger sound libraries, but its complete instrumentation, flexible 'virtual ensemble' sizes and easy‑on‑the‑ear reverb enable it to tackle full scores with aplomb. Cheap, cheerful and highly effective! Garritan +1 757 726 7537.